Another thing I can't explain: A tank at 1/4 full, but still well about the coil intake ports, will be a weak vape on SS. I'll top it off with e-liquid and that small a temperature change will suddenly make the vape strong again. But the live ohms on the analyzer doesn't seem to change. Very, very touchy, SS is. But when it's working, it's nice. Thanks, David. Excellent. Please do post the 3.125, I'd like to give it a try. I've been tweaking the values on my own, too, but it's a game of wack-a-mole. Amazing how small the values need to be to affect huge differences in the vape. It's great that we have the ability to do this ourselves in the DNA 200, it seems no mod maker, with pre-build values, or simple, single TCR values has nailed it yet. Part of the 'problem' especially with SS wire and it's low TCR is it becomes erratic and I'm thinking of experimenting with adding 3-4 values in the 480-550 F range which is where I typically vape. Yeah, I strongly recommend people play with the values, particularly in the temperature ranges they vape in! Hmm .. that's generally TC kicking in from a dry(er) wick. Trick to test is to completely plug off the airflow (I use my fingers) and while drawing (sucking) let go of the airflow holes. As I mentioned as well .. compound that problem with Preheat! One other 'tip' is to have the cotton in the coil rather tight and by that I mean it barely goes through the coil, then shift right and left to loosen. This stabilizes the TC and eliminates spitting. Next cut the cotton in Tanks shorter as in barely long enough, next I comb out the ends using something pointy eg tweezers with pointy ends or a small thin paperclip, and retrim the ends. Another problem is long leads, the leads are often hotter than the coils themselves in TC, so just keep that in mind. Often I'll do 90 degree bends of both lead wires, spaced coils (not touching), and attempt to avoid cotton from touching or resting on the leads. Thanks, you're really on to something with disabling preheat punch. 3.125 didn't seem to win, yet, but more testing is required. I'm slowly coming to the conclusion locking ohms may be required with this particular atomizer. The Atomizer Analyzer suggests it's stable, but I can't seem to keep it stable in actual use. What Atty do you have? At the moment, your v4 with preheat disabled is delivering the best vape. How long that lasts, has yet to be seen. This is another reason I wish we had more than 8 profiles. I'd like to dedicate more to just SS variations. The one I'm testing at the moment is the Silo Beast (with the shorty tank section). Beautiful tank. The coil is an atlantis-compatible Saucecode RBA with custom-made coil. SS 316L, 28 Guage, 7 wrap on a 2mm bit. Around 0.62 ohms. Literally everything you just said is EXACTLY what I do, too. Haha. Everything; the tightness, combing the ends, re-triming after the comb, shorter cotton leads, spacing, 90 degree bend to prevent hot legs. I am running a 0,285ohm spaced coil in my Goblin mini. I have tried the version 4 and 3,125 and the version 3 of yours and i have settled with the version 3. I get great flavor, but some sizzling on the coil also after I stop vaping? I have the temp set at 235C and 35W and still some fluctating when i test in device monitor. I will try the cotton suggestion of yours when the tank is emty I may have to little cotton in there. Is it better to run a higher ohm with the SS? At least the EScribe Device Monitor is very accurate as to the vape. When it's a good vape, you can see it on the graph, and vice versa. Using this as a guide, I lowered the Wattage so that it was close the target I knew I needed to be at. This would deliver the desired, smooth vape after about 2 seconds. I then used the preheat punch to dial in a fast, but still smooth ramp up. Everything is really great, for now. In my case, for .62 ohm 316L 7 wrap, 28 gauge on 2mm bit, this ended up being 20 watts, 410F with a preheat of 30W, 1 second long, 9.8 punch and with your v4 SS curve. There is wisdom in how Evolv set this up, you just have to work with the physics of the coil and not fight it. You can't just set a high wattage and hope for a one-size-fits all profile (well, the wattage is easy to change on the device, as needed, I guess). This is why we really need more profiles. I suspect this will only work for this build and repeats of it. I'll report back on how this profile scales to other SS builds. Ideally the issue to overcome stability with SS or for that matter most TC wires is the Gauge. Big Man (power) vs Little Man (wire) as the Little Man becomes larger (Lower Gauge) it won't move around as much being pushed by the Big Man. Bad analogy I know, but it's the reason I prefer 24 Gauge and Mixed Wire coiling. Stability. I do, lets call them 'odd' tests especially once I notice something. Example, same with SS, I wads comparing and calibrating Sweet Spot 'TiFe' wire, their wire is an alloy not pure Grade 1 Titanium and I was getting a burnt taste and I couldn't figure it out .. I thought the legs maybe .. 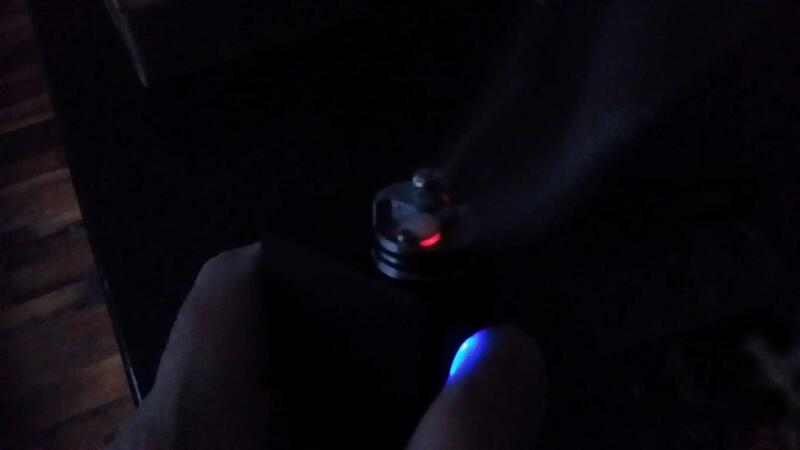 I made a coil in the Veritas RDA and I turned the lights off and looked http://i.imgur.com/c4skTVD.jpg the coil itself the TC was perfect. Now I read a Saucecode RBA .. wow I have one of those it drove me CrAzY and I both hate it and my Triton V1 because of it. I do not purchase any wire smaller than 26 gauge (see above), even my Ni200 is 26 gauge Tempered. What's crossing my mind to try is Twisted SS316L and Kanthal on higher gauge to stabilize the wire. My 26 gauge SS316L works okay, my 24 gauge much better. Another issue with SS3XXX is much of it is cold pressed and my eyeballs popped-out the first time I pulsed SS it not only has hotspots on the coil but embedded in layers in the wire itself. The best SS316L build I have is a 7.5 warp 3 mm with 90-deg legs that I pulsed to remove the hotspots and as I've mentioned above for technique. I read somewhere about the coils 'sizzling' yeah most will until the temp goes down, but some of that is with the wicking tighter vs looser. Different metals and more obvious is higher gauges cool faster. Most of my Ti builds stop almost instantly.